Tom Fitzgerald is a member of The Fitzgerald’s, (thefitzgeralds.net) a family band from Bancroft, Ontario that has released several recordings and tours extensively. He is accomplished on the fiddle, mandolin, guitar, and as a step dancer. Tom taught at AlgomaTrad 2015 and we are pleased to have him back this year. Tom has toured professionally since he was 10 years old. 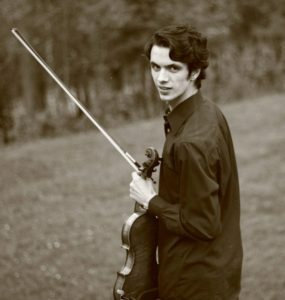 A high point of his career was winning the title of 2012 Canadian Grand Master Fiddle Champion in Ottawa, ON, as a first-time competitor. Later that year he placed 5th in the US Grand Masters Championship in Nashville, TN. This past year, Tom became an official artist of D’Addario Canada. He has also performed alongside Natalie MacMaster, Leahy, Wayne Rostad, and appeared on the Tommy Hunter CBC special “Talk About the Good Times”.